Even though past peak, there are plenty still around. Plus, the scrub oak is turning color too! The photos I took today for this slideshow were taken along Ouray County, Colorado, CR 8 up to Vista Point, then along a few doubletrack (ATV) trails that start there, coming out eventually at Stealey Mountain Trailhead. From there I went on up to Owl Creek Pass, then headed back down toward Ridgway. Note that we’ve already had snow in the mountains, and some of it is left along the trail. This can make for really squirrely riding! I came across another motorcycle rider that I’d met up at Peach Valley—small world! 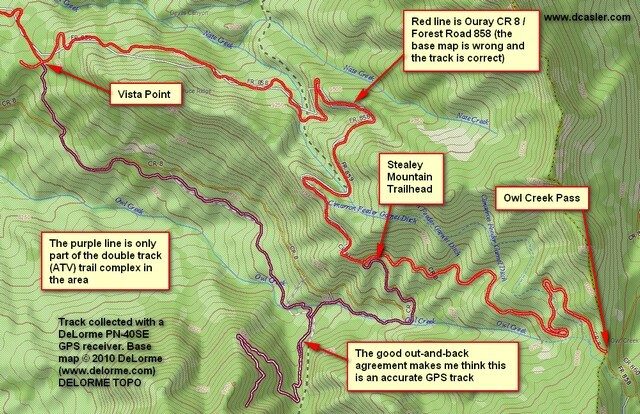 Click on “continue reading” to see the GPS map. Part of Stealey Mountain Trail Complex. The good out-and-back track agreement makes me think this is a good track. By the way, this is the first video I’ve loaded here that I put together using CyberLink PowerDirector 9 Ultra. I find it much easier to use than Roxio VideoWave 2011, plus it doesn’t crash nearly as often as VideoWave. In fact, so far, it’s only crashed on me once, and I’ve made several videos. I like it! But (arrgh! ), one week after I purchased it, they came out with version 10, and they want me to pay for the upgrade. This entry was posted in Fall Color, Motorcycling, Ouray County, Video and tagged owl creek pass, Stealey Mountain Trail Complex. Bookmark the permalink. I have a map in one of the posts that’s pretty complete. You can look at that. I’ve been in both on a motorcycle and on a Polaris RZR. Derrick, it’s been a couple years since I’ve been up there, but haven’t heard of any changes. It’s an ATV trail, meaning no vehicles wider than 50 inches. Of course you can bike or hike or bring in horses. Regarding camping, you’ll need to consult the rules of the Forest Service. I rarely went into the trail complex on weekends. Mostly weekdays and usually found the entire area vacant maybe 80% of the time. There are no “official” campsites anywhere near the complex, but in general you can “dry camp” anywhere–but check with the Forest Service.